Every year, approximately 35,000 bulls are tormented and killed in bullfights in Spain alone. Although many bullfight attendees are American tourists, 90 percent of these tourists never return to another fight after witnessing the relentless cruelty that takes place in the ring. 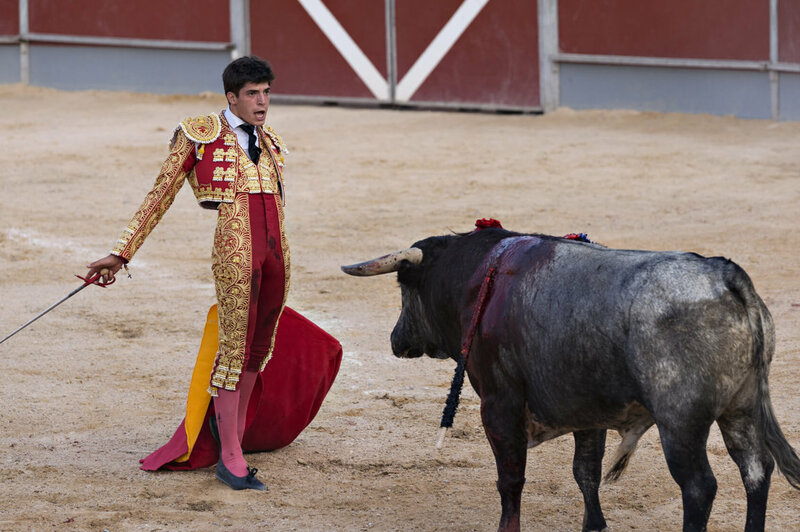 Spanish bulls and their many counterparts in Mexico and other countries are victims of a savage display disguised as "art" or "entertainment". Spanish and Mexican bullfight advertisers lure American tourists with mystique. They claim the fight is festive, artistic, and a fair competition between skill and force. What they do not reveal is that the bull never has a chance to defend himself, much less survive. Many prominent former bullfighters report that the bull is intentionally debilitated with tranquilizers and laxatives, beatings to the kidneys, petroleum jelly rubbed into their eyes to blur vision, heavy weights hung around their neck for weeks before the fight, and confinement in darkness for hours before being released into the bright arena. A well-known bullfight veterinarian, Dr. Manuel Sanz, reports that in 1987 more than 90 percent of bulls killed in fights had their horns "shaved" before the fight. Horn shaving involves sawing off several inches of the horns so the bull misses his thrusts at the altered angle. The matador, two picadors on horses, and three men on foot stab the bull repeatedly when he enters the ring. After the bull has been completely weakened by fear, blood loss, and exhaustion, the matador attempts to make a clean kill with a sword to the heart. Unfortunately for the suffering bull, the matador rarely succeeds and must make several thrusts, often missing the bull's heart and piercing his lungs instead. Often a dagger must be used to cut the spinal cord and spare the audience the sight of a defenseless animal in the throes of death. The bull may still be fully conscious but paralyzed when his ears and tail are cut off as the final show of "victory." Mexican bullfighting has an added feature: novillada, or baby bullfights. There is no ritual in this slaughter of calves. Baby bulls, some no more than a few weeks old, are brought into a small arena where they are stabbed to death by spectators, many of whom are children. These bloodbaths end with spectators hacking off the ears and tail of the often fully conscious calf lying in his own blood. The so-called "bloodless bullfights" that are legal in many U.S. states are only slightly less barbaric than their bloody counterparts. Although the bulls in these "fights" are not killed in the ring, they are often slaughtered immediately afterward. During the fights they are tormented, teased, and terrified. The bulls aren't the only victims of the intense cruelty of the arena. According to Lyn Sherwood, publisher of an English-language bullfight magazine, horses used in bullfights are "shot behind the ear with dope. The horses are drugged and blindfolded and they're knocked down a lot." These horses, who are often gored, usually have wet newspaper stuffed in their ears to impair their hearing, and their vocal cords are usually cut so their cries do not distract the crowd. Fight promoters claim the horses are "saved" from glue factories; this means these animals are often old, tired plow horses who end up being knocked down by bulls weighing up to a half a ton. Bulls today are specially bred for bullfighting. They are raised on hundreds of registered bull ranches located in various parts of Mexico. Selective breeding has enabled ranchers to create a bull who will die in a manner most satisfying to the public. Because the sight of a wounded bull desperately trying to retreat from the ring would ruin the image of the "sport," bulls are bred to return to the torture repeatedly and appear to be a wild and vicious challenge to the matador. While its exact origins are not known, bullfighting is believed to have emerged in connection with ancient fertility rites. In 1567, Pope Pius V decreed that "exhibitions of tortured beasts or bulls is contrary to Christian duty and piety." He called for "an end to such bloody amusements, abject and more appropriate for devils than for men." The penalty for violating this decree, which has never been repealed, is excommunication. In 1725, bullfighting began to assume its present state when Francisco Romero invented a stick with a red cloth suspended from the end, which he used to tease and torment the bulls. Today's bullfighting maneuvers became defined in the 1700s and have changed little since. Recent polls of Spanish citizens show they are not particularly interested in attending bullfights. But tourists' money keeps bullfight profiteers in business. If you are planning to visit a country that permits or encourages bullfighting, please tell your travel agent you are opposed to animal cruelty in any form. Many tourist resorts are building bullfight arenas as part of their "recreation" facilities; refuse to stay at such a resort, and write a letter to the owner explaining why you will not stay there. Instead, visit the resort town of Tossa de Mar, which was the first town in Spain to ban bullfights and related advertising. Tell others the facts about bullfighting and urge them to protest as well. When tourists stop attending bullfights, profiteers will stop the cruelty. Bloody or bloodless, bullfighting is a senseless, degrading spectacle that has no place in a civilized society.